Remembering sharpshooter and front-office ace George Irvine, who died at age 69 earlier this year. George Irvine never had much luck as a head coach. The Husky hoops legend skippered two NBA teams for a total of four seasons, racking up a hundred wins and nearly twice as many losses. But Irvine forged a front-office legacy during his 15 years with the Indiana Pacers. He hired Donnie Walsh, who went on to become the most successful president in franchise history, and in 1987 he and Walsh drafted a lanky sharp-shooter named Reggie Miller, the best player to ever wear a Pacers jersey. 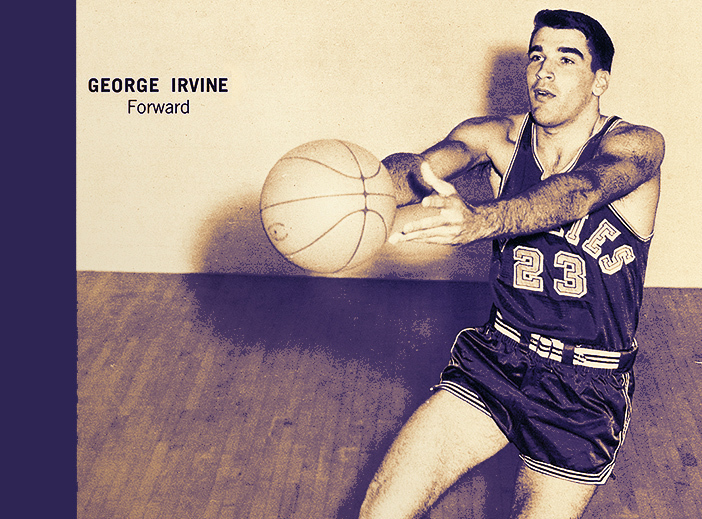 Irvine, who died at age 69 in May, flourished as an All-Pac-8 forward at the UW (he still ranks seventh in school history in points per game). He transformed into a role player in the pros, logging six seasons in the flashy heyday of the American Basketball Association. Here’s a snapshot from that fabled era: On a November evening in 1972, Irvine and the Virginia Squires squared off against the Carolina Cougars—two long-lost franchises from a long-lost league. Still, you’ll recognize the Hall of Fame names of his teammates, such as Julius “Dr. J” Erving and George “The Iceman” Gervin. As for our Husky, he went by “Hawkeye”—a nod to his lights-out shooting. That game in 1972? Hawkeye sunk 14 of his 16 shots and led all scorers with 32 points. Dr. J only had 30 that night.